Born in France in 1923, André Morin’s passion for engineering and design was unmistakable, even at a young age. As a teenager, Morin was already designing small aircraft, often selling his hand-drawn plans. He continued to cultivate his passions by studying aeronautical engineering, and put his skills into practice during the war, working at an aircraft design studio. There he helped develop an aircraft capable of crossing the Atlantic Ocean. After the war, Morin remained in Paris and continued designing. His focus however, deviated from aviation and instead used the aeronautical principles in land vehicles. 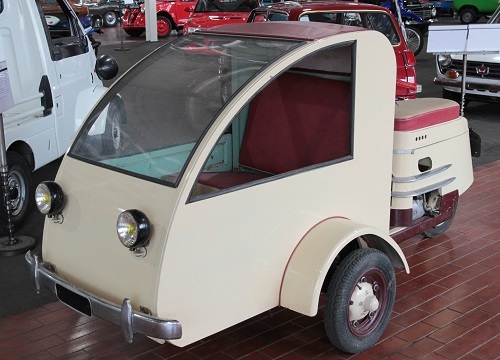 In 1948 Morin advertised plans for the Aerocar, a build-it-yourself microcar. 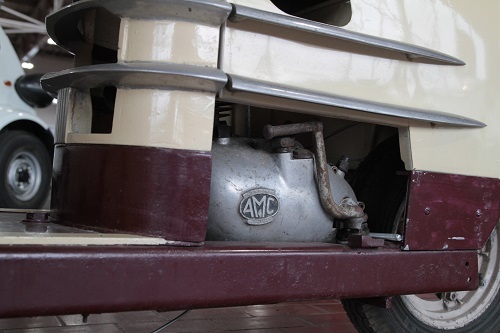 The aerodynamic, 3–wheeled, 2-seat convertible was equipped with a 125cc engine and made with Duralonix-Aluminum, a light-weight alloy. The Aerocar met an unfavorable market and most likely never made it out of prototype construction. Morin’s next project, a luxury scooter named the Scootavia (scoot- for scooter and –avia for aircraft, avion in French) appeared in 1949. 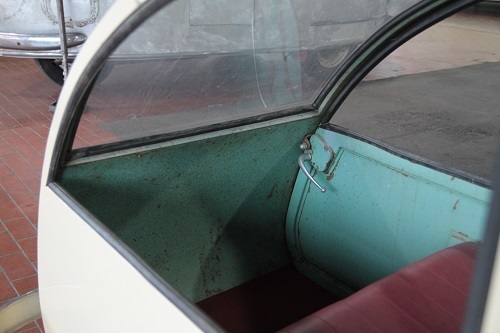 The Scootavia, which was made to order or sent in kit form, fared slightly better than the Aerocar, with sales reaching close to 140 units. 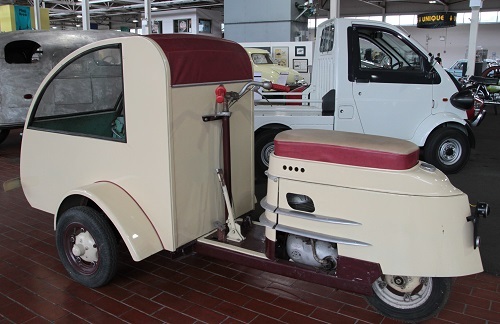 The first scooters were equipped with a 125cc engine; after 1951, Morin redesigned them with a 175 cc engine. Presently there are 18 Scootavia scooters known to exist. Half a Scootavia scooter with a passenger car attached to the front, the Scootavia Tripousse is the only one of its kind. It is said by some that this vehicle was ordered by a woodcutter who wanted a dual-purpose vehicle- one that could be used in the forest to collect wood, but also one that could be used to on the promenade to carry his wife. However, the vehicle did not fit easily between the trees and was returned to Morin with only 12 kilometers (7 miles) on the odometer. Others say that this vehicle may have been a prototype taxi that was secretly developed for the Indochinese market. While this may be the only Tripousse remaining, there is photographic evidence that at least one other, similar in design, existed. Scootavia ended production in 1956 and Morin went back to his aviation roots, designing light aircraft, the M31, M81, and last and better-known creation, the M85 were offered to homebuilders for construction. The plans are still available for purchase today.